Do you want to soften lines and wrinkles without looking unnatural? Dr Lina Kotecha places anti wrinkle reduction injections to avoid this unnatural look and does so by not over-treating and so maintaining some natural looking movement whilst still softening lines. Thousands of men and women receive wrinkle reduction injections every year and is the UK's most popular cosmetic treatment for the removal of wrinkles. Combining a quick procedure with undeniable results that relaxes the muscles of facial expression, wrinkles are made less visible; resulting in a more natural and rejuvenated look. The treatment involves injecting small quantities of Botulinum toxin into the muscles which are causing your lines/wrinkles. The injection process itself will only take several minutes. The product used by Dr Lina Kotecha at Smile Essential Dental Practice is Azzalure® (Galderma) which is one of the few FDA approved botulinum toxins on the market. It has been adapted from Dysport® which has a 20-year long history of product consistency and safety. It usually takes two weeks for the effects of Botulinum toxin to be fully appreciated, but you will notice the first changes after four to five days. The effects usually last three to four months depending on your response, but following repeat treatments the effects may last for longer. It is not immediately reversible but always gradually wears off. Botulinum toxin has had a bad reputation in the past for producing the 'frozen face' look. Dr Lina Kotecha is very keen to avoid this unnatural look and does so by not over-treating and so maintaining some natural looking movement whilst softening lines. The beauty of wrinkle reduction injections is that it shouldn't be obvious to people that you have had treatment – only that you look rested and fresh. 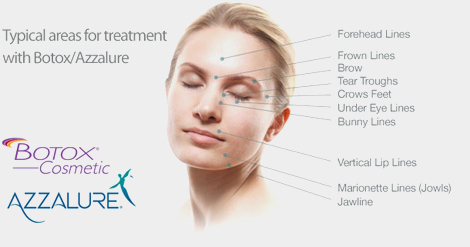 Please note: Any botulinum toxin procedure will only be undertaken after your face to face consultation with Dr. Lina Kotecha during which a full assessment will be carried out and a full list of cautions and contraindications discussed.